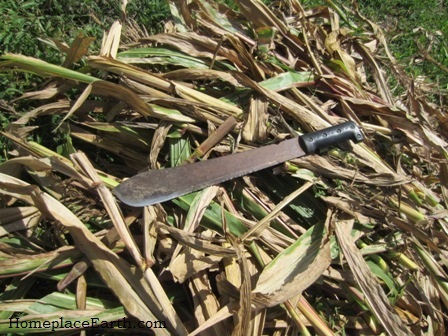 Use a machete to cut corn stalks into manageable lengths for the compost pile. As you harvest the last of your summer crops, realize that the steps you take now are the beginning of next year’s garden. You could just leave everything as it is, looking not so good through the winter. Mother Nature likes to keep things green, so will provide her own seeds to fill in the space if you don’t. That’s where the unwanted weeds come from. The spent plants from your summer crops are actually valuable compost material at the ready. 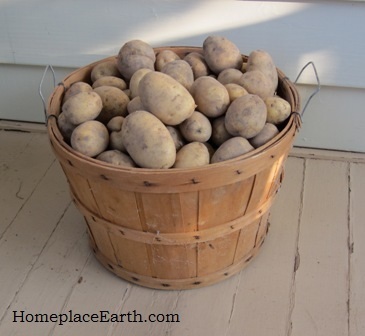 Harvest them for your compost pile as you clean up your garden. Next year this time the compost you make now will be available to spread as fertilizer for your garden. If you have grown corn and sunflowers, those stalks are wonderful sources of carbon for your compost. Some folks till all their spent plants, including cornstalks, into the soil. However, since I advocate managing your garden with hand tools, I chop the stalks down and cut them into manageable lengths with a machete, as shown in the photo. The cornstalks then go into the compost pile with all the other harvestable plants, plus some soil. You can see me in action chopping cornstalks and adding them to the compost in my DVD Cover Crops and Compost Crops IN Your Garden. When you look at the plants in your garden, make sure to recognize their value as a compost material. Winterkilled oats in late February. After you clean up the garden beds by harvesting compost material, you will need to plant cover crop seeds. 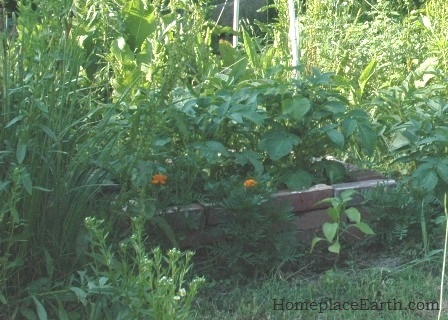 If you have beds producing food through the winter, that’s great. It’s the rest of the garden I’m talking about. The crops you plant now will determine how each bed is to be used next year. If you intend to have bed space devoted to early season plantings, such as peas, lettuce, greens, and onions, you want the cover crops to be finished by then. 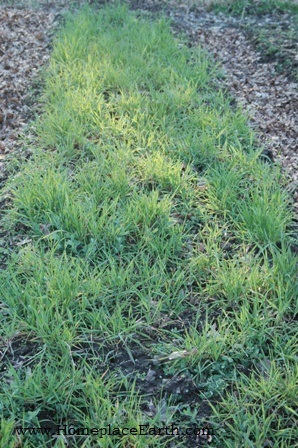 Cereal rye, often called winter rye, is a great cover crop for winter. However, it is not so great if you are managing it with hand tools and you want to plant those early spring crops. The rye will have put down a tremendous amount of roots and be growing vigorously in early spring. 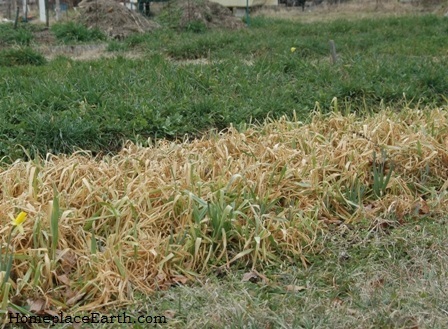 Options to plant now in those beds destined for early spring crops are oats or Daikon radish, two crops that will winterkill if you get severe enough winter weather. Here in Virginia in Zone 7 we usually have weather that will cause these crops to winterkill, however I remember a few mild winters when they didn’t. 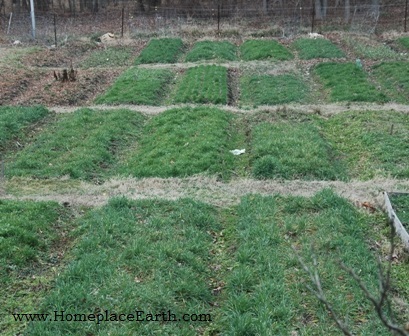 I also remember a winter I planted oats in a bed that had compost piles on the bed just to the north of it. The compost provided enough protection to keep the oats growing into the spring. If you choose the route of planting crops to winterkill, you need to get them planted early enough so that they have a chance to produce a large volume of biomass before the weather turns cold. If you don’t already have these crops in the ground, the time to plant them is NOW. Actually, anytime in the past three weeks would have been better. Another alternative for that space for early spring crops is to mulch it with leaves for the winter. The leaves will protect the soil over the winter and when you pull them back in early spring you will find a fine layer of compost where the leaves meet the soil. The worms would have been working on those leaves all winter. Pull the leaves back a couple weeks before you intend to plant to allow the sun to warm the soil. This rye and vetch cover crop was cut at pollen shed (May 7) and will dry to become a mulch for the next crop. You want a thick cover of plant growth with any cover crop. Planting at the right time will encourage that. The legumes, such as hairy vetch, crimson clover, and Austrian winter peas are often used as fall cover crops. It is best to get them in about a month before your last frost to ensure a good stand. That should encourage you to begin cleaning up the parts of your garden that have finished producing. Not all your garden beds will be host to the same cover crop, so you can do it bed by bed—an advantage over working on the whole garden at the same time. These legumes will begin to grow and will provide protection for the soil through the winter. In early spring they will take off, growing to their full capacity by the time of your last spring frost. You may have seen crimson clover flowering in garden beds at that time. You can cut this biomass with a sickle and add it to the compost pile. It would be a nitrogen component. You could lay it down as mulch right in the bed, but it would soon dissolve into the soil and not last as long as mulch that has more carbon. The advantage of the legumes is the nitrogen they leave in the soil from the nodules on their roots. If you should need the bed sooner than the date of your last frost, you could easily cut the legume a little early, leaving the roots. They are not so tenacious that you can’t plant into the bed soon after cutting. The winter cover crop that will produce the most carbon for your compost and/or mulch is the rye that I mentioned earlier. It is also the crop that you can plant the latest into the fall and still have a good stand; making it a possible choice after things like tomatoes and peppers that produce until the first fall frost. 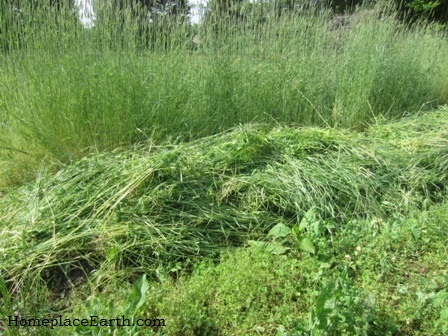 You can let it grow to seed and cut it in early summer (mid-June here), giving you seed and mature straw. Or, you can cut it at pollen shed (about May 7 here) and leave it in the bed as mulch. Wait two weeks before planting to let the roots begin to die back. The bed would be suitable for putting in transplants, but not for seeds at that time. Often rye is planted with a legume. If you are planting late in the season, choose Austrian winter peas as a companion. 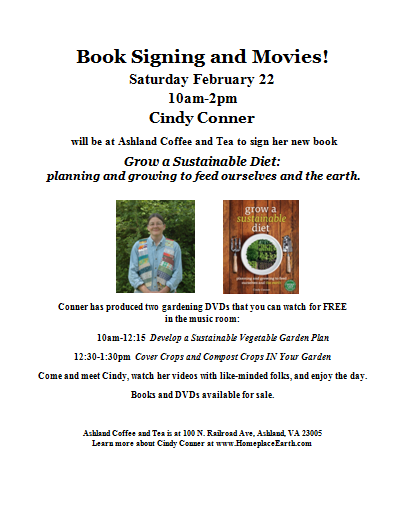 The information in my DVD Develop a Sustainable Vegetable Garden Plan and my book, Grow a Sustainable Diet, helps you to determine how to plan these cover/compost crops into your crop rotation. In the DVD you see me explaining a four bed rotation as I fill in the crop selections on a whiteboard. The book has three sample garden maps accompanied by explanations. The sample garden maps in the DVD and in the book have crops filling the beds for all twelve months of the year. Knowing how to fit enough cover crops in your garden plan to provide all of your compost and mulch material is definitely a skill that takes concentration and practice to learn. I hope the educational materials that I have produced will help many gardeners along that path. The most important thing is to just get started and plant something. Make note of your planting time and watch how it grows. The learning is in the doing. I have just come back from a great weekend at the Mother Earth News Fair in Seven Springs, PA. It was an opportunity to catch up with friends (old and new), the Mother Earth News editors, and Ingrid and Sara from New Society Publishers. The internet is nice, but after conversing by email all year it was wonderful to speak in person to all these folks. Speaking of speaking—I gave a presentation on my upcoming book Grow a Sustainable Diet. New Society had posters of all their authors who were speaking, including me. I discovered that my book will carry the Mother Earth News Books for Wiser Living Recommendation tag! I also spoke on Solar Food Dryers. Both talks were very well received. We came home on Monday by way of Pittsburgh to check out the seed library there, but that’s a story for another day. It is time to get back to the garden and plant cover crops. Right now in Zone 7 (first expected frost in late October) we still have good cover crop choices, but time is running out for the legumes such as clover and vetch if we want to get them off to a good start. The time to plant crops intended to winter kill is past. If you wanted to have radish or oats in your bed, expecting a heavy cover before frost, then dying back in January, you would have needed to plant that a few weeks ago for best results in Zone 7. When planted early enough, those crops put on a lot of growth in the fall, crowding out weeds. 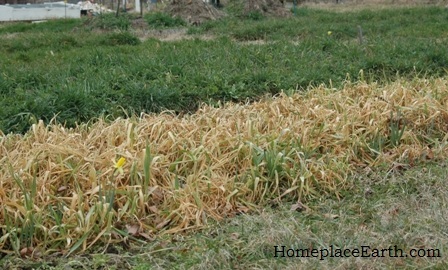 Given a hard enough winter, they will die back and leave the soil ready for planting in early spring. However, if they are in a protected spot or the winter is too mild (as it was in 2012), they might not succumb to the weather. One year I had oats planted in a bed with a compost pile just to the north. That pile was enough protection to keep the oats from dying. It would have been a good place to have had winter greens for eating that year. Wheat and winter rye could go in now. It is good to plant a small amount of a legume, such as hairy vetch or Austrian winter peas as a companion. Too much legume, especially hairy vetch, can overwhelm the grain crops if you intend to grow them out to mature grain. For more information on these and other possible crop choices, refer to Managing Cover Crops Profitably. If you don’t have a print copy, you can read it online http://www.sare.org/Learning-Center/Books/Managing-Cover-Crops-Profitably-3rd-Edition. 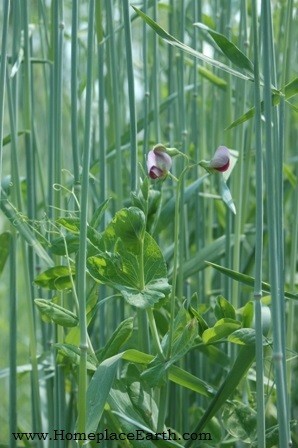 Winter rye and Austrian winter peas are the two crops that can be planted the latest in the season and still do well. Although I try to finish planting cover crops in October, I’ve planted rye and winter peas in November when necessary. Except for the crops planted earlier intending to winter kill, these fall planted cover crops will put on limited growth, then slow down when the weather turns cold. They wake up in the spring and start growing like mad. So, if your fall planted cover crops are short through the winter, don’t worry, that’s normal. At the resource page on my website you will find a handout with cover crop suggestions for fall, spring, and summer planting. When deciding which cover crop to plant where, look ahead to what will be planted in each bed next year. You want the cover crop to be ready to come out when it is time to plant the next crop. This might not be as important if you were going to till it in, but I’m talking about managing these crops with hand tools. I like to plant rye in rows, rather than broadcast the seed, where I will grow out the rye to maturity the following summer, then plant carrots between the rows of rye stubble. Those become my winter carrots that you can read about here. My blog post Choosing Which Cover Crops to Plant Where will help you with your fall garden planning. It is possible to grow all your compost materials in your garden to feed back the soil as you grow. My post Planning for Soil Fertility and Compost Materials will help you with that. Managing cover crops using only hand tools can be confusing to new gardeners and to gardeners who have always tilled them in. I understand that, which is why I produced my DVD Cover Crops and Compost Crops IN Your Garden. In that hour long video you see me in my garden each month (except August) from March through November, explaining what cover/compost crops are growing and how to manage them. Besides learning about each crop and seeing them growing, you will see me planting, cutting grains with a sickle, threshing, and shelling corn. My DVD Develop a Sustainable Vegetable Garden Plan shows you how to plan these crops into your rotations to keep your garden beds full all year. As you clear your beds to make way for cover crops, your spent crops become your next compost pile. Your garden gets cleaned up, the cover crops keep it green all winter, and with the right planning, the beds will be ready for their next crop come spring. Enjoy the adventure of cover crops! The intensity of the gardening year is winding down. Once the harvest slows or stops, many people turn their attention elsewhere. However, you’re not done yet. You need to plant cover crops to protect the soil and keep it active. After all, Mother Nature likes to keep herself covered up. Cover crops are a great way to increase organic matter in your soil. In order to plant cover crops, you need to clean up what has finished in the beds. I prefer to think of it as harvesting the biomass from the spent crops for compost material. Your garden gets cleaned up, compost built, and cover crops planted. There are many choices for cover crops-crimson clover, hairy vetch, Austrian winter peas, and cereal rye are some of them. If you are tilling everything in the spring, which crop you plant now might not be so important. (It is, actually, if you are planning fertility, but I’m dealing with timing in this post.) 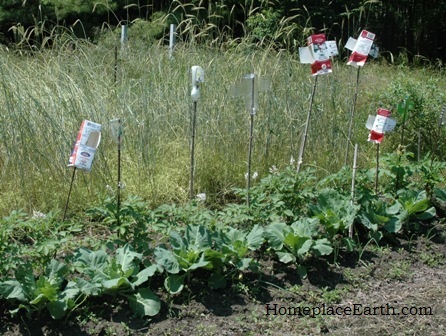 If you are managing your garden with hand tools, your crop choice makes all the difference. Knowing what crop will be in each bed next year determines what should be planted this fall. Thinking of those crops that you will plant the earliest in the spring, peas, lettuce and onion sets come to mind. In those spots, it is best if the previous crop has winterkilled. In that case, the winterkilled cover crop has to have put on all its growth in the fall, meaning it needs to have been planted around the end of August or early September (in Zone 7). I have to admit, I’m a little behind on that myself, and plan to put in some oilseed radish this week. Another choice might be oats. If you want to actually harvest oat seed, it needs to be planted in the spring. 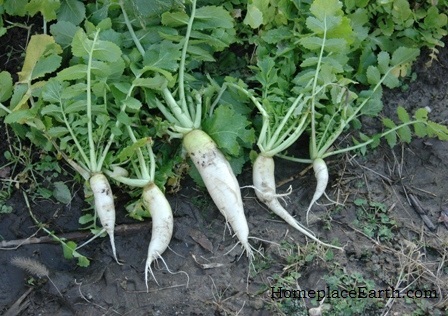 The radishes–oilseed, fodder or Daikon–can be harvested for your table for roasting or fermenting until about January 1. Most likely, in Zone 7 and colder, they will die back in January, but if we have a mild winter, like the last one, these crops may need a little help to return to the soil in February. In that case, cut the oats or hoe to chop the radishes and leave everything in place. If you miss your window of opportunity for planting and want to do good things for the soil, plus have it ready for the next crop on March 1, mulch that space with leaves. Pull them off a couple weeks before you want to plant the early spring crop to allow the soil to warm up. Austrian winter peas is my crop of choice to precede things that I will plant in early April. It is too short to pull out on March 1, but has put on some growth and made the soil quite nice by April 1, when I normally plant my potatoes. I put the biomass from the winter peas in the compost. It is also the legume that can be planted the latest in the fall and still make a good crop. Planted in early September, it will grow a lot in the fall and maybe even flower. If that happens, it will most likely winterkill. Planting it in October insures that it will be a nice green cover through the winter. The legumes are easy to pull out or cut if you need the bed sooner than expected, and the soil is wonderful and ready to plant in, with minimal preparation. 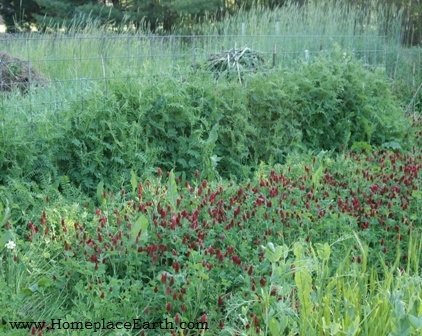 Other legume choices, besides winter peas, are crimson clover and hairy vetch. I might plant those things in the beds that I will plant a main crop in about the end of April, after the last expected frost. For any of these cover crops, it is to your advantage to leave them growing until they are flowering. At that point they have put on their most growth in biomass, both above and below the ground. In addition, the flowers provide nectar to the honeybees and other beneficial insects. The clovers and vetches do best if they are planted in September or early October here in Zone 7. If you are running late with your fall planting, you can go ahead and put them in and see what happens, but know that an early frost or harsh winter might set them back. So far, the choices I’ve mentioned are legumes. The real soil builders are the carbon crops, particularly cereal rye. You are going to get the most biomass from the roots with cereal rye, sometimes referred to as winter rye. This is different than ryegrass. What you want looks like wheat seed, not grass seed. If you talk to gardeners with tillers who have planted rye, they will tell you that it is important to till it in early because of the mass of roots that need to be churned up to decompose. If you are managing your garden with a tiller, that is good advice. If you wait past mid-March, the rye will be so thick, above and below the ground, the tiller would have a hard go of it. With hand tools, however, we are gardening smarter, not harder. I consider rye to be an important soil building and compost crop, so I’m not in a hurry to take it out. I want it to express itself as much as possible. If I let it express itself all the way to seed, it will be mid-June before the bed is ready for the next crop. At that point, I will have rye seed to eat or plant again in the fall (after I thresh it out), and straw for compost building. The plant will be finished, and even though you will see stubble in the bed after the crop is cut, you will be able to easily transplant into it or run a hoe through it to make furrows for the seeds of the next crop. Leave the stubble there and it will slowly compost back into the soil. Removing the stubble would be unnecessary work. If you were growing wheat to eat, which I highly recommend even if it is a small amount, you would manage it the same way. Where I need the benefits of the cereal rye, but want to get the next crop in before mid-June, I’ll cut the rye at pollen shed, which is about May 7 here. That’s when it is flowering, which is the point of the most biomass. If it is cut earlier, the plants will grow back, trying to get to that seed stage. When it is shedding pollen, it is already thinking about going to seed. The roots, however, will be a mass that will be hard to get my garden fork into, let alone turn over. Of course, I’m not going to turn it over anyway. I cut the rye with my sickle and let that biomass lie there for two weeks to settle. Then I transplant into it, using a sturdy trowel or a soil knife for the job. In this case, the roots are on their way to decay, but there is still a lot there, so you wouldn’t be able to just hoe a row for seeds. This is a good system for transplanting things like tomatoes, peppers, and squash–crops that would benefit from the natural mulch that is just there—you haven’t had to haul anything! 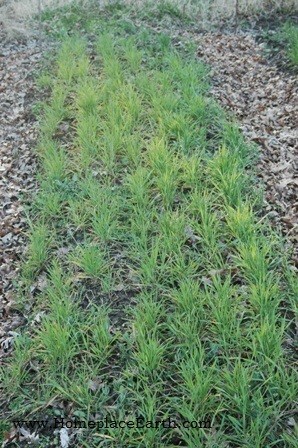 If the rye was cut May 7, transplanting wouldn’t take place until May 21. 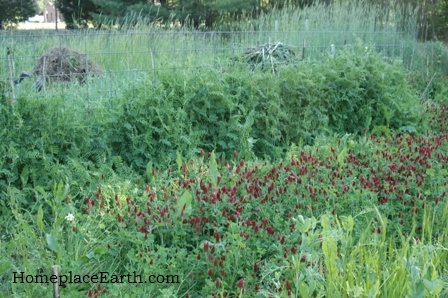 You can see how all this works in the garden in my DVD Cover Crops and Compost Crops IN Your Garden. I’ll be at the Mother Earth News Fair this weekend at Seven Springs in Pennsylvania. Come to my presentations–Plan a Sustainable Vegetable Garden, Sustainable No-till Gardening, GROW BIOINTENSIVE® Sustainable Mini-farming and Solar Food Drying. Between my talks you can catch me at the Homeplace Earth booth. See you there! 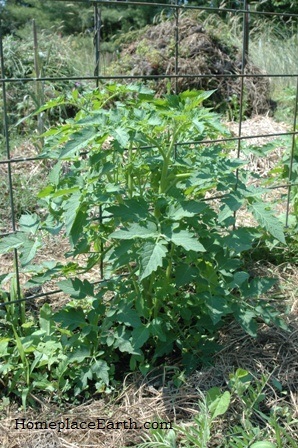 Many people have asked me what they can do to prevent their tomatoes from succumbing to disease. The first answer to protecting any of your crops from disease is to start with the soil. Have your soil tested and correct any imbalances with organic amendments. If your local feed store or garden supply can’t offer help with organic information, check with your state organic organization or Cooperative Extension Service. In Virginia, Countryside Organics and Seven Springs Farm are two sources of amendments. The two places I’ve used for my soil tests are Timberleaf Soil Testing and A&L Eastern Laboratories. Timberleaf results give suggestions for what product to add per 100 sq. ft. It is less expensive to have a test done at A&L. A&L gives great test results, but as usual with soil tests, their results tell you how much of each thing is needed (nitrogen, phosphorus, potassium, boron, etc) and you have to figure out what product to use and how much, since only a small percentage of that item is in the product. There are other labs and services out there that can be of help. It might be that the place you find to purchase supplies can help you interpret your test results. Dr. Mark Schonbeck, a friend of mine in Floyd, VA, can interpret soil tests and offer recommendations. One problem with tomatoes is blossom end rot. When your tomatoes begin to ripen and you have a black spot at the end, that’s blossom end rot. If you look it up, the books will tell you that it is caused by a calcium deficiency, or too much water, or too little water. If you have had your soil tested you will know if there is a calcium deficiency. Another reason I’ve come to know is if there is a cold spell after I’ve set my tomatoes out. In that case, the first flush of tomatoes might have it, but the rest will be fine. So, don’t get yourself too stressed if you see it. If it is calcium, well, you should have amended after your soil test. If it is too much rain, know the rain probably won’t last forever. If you’ve left those poor plants on their own in a dry time, get out the hose. The biggest problem here in the mid-Atlantic is blight. It doesn’t really matter to me the exact name or if it is early blight or late blight. The bottom branches of the plants begin to turn brown and die and it gradually works its way up the plant. The fungal spores that cause that are in the soil and the disease begins in the leaves that hang down and touch the soil. Furthermore, if the soil is bare under the tomatoes, when it rains, those spores are splashed onto the plants. Now is the time you can take preventative measures. Trim the lower branches of your plants so nothing hangs down and touches the soil, and mulch around the plants. You will need to come back in a couple weeks and trim your plants again because they will have put out more growth. 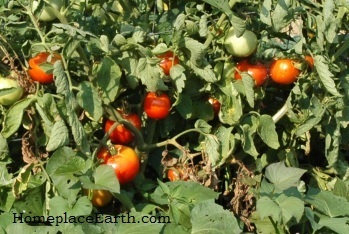 It is hot and humid here in the summer and giving tomatoes a little breathing room will do wonders. Open up that space at the bottom and get the air flowing. Listen carefully, your tomatoes will be thanking you. Your disease prevention should have started last fall by planting cover crops. Cover crops do wonders adding organic matter to the soil with their roots and later with the biomass grown on top. That’s where your mulch can come from. Planting cereal rye in the fall provides you with the most mulch, but your tomatoes will be planted a little later, since you cut it in place when it sheds pollen and then wait two weeks to put in the tomatoes. Legumes, such as hairy vetch, crimson clover, or Austrian winter peas, can be cut earlier, allowing earlier transplanting of your tomatoes. The resulting mulch, however, is not as long lasting. 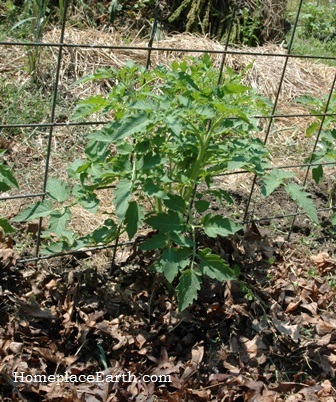 The mulch in the picture of the tomato before trimming is hairy vetch that was so prolific when I cut it in the spring. Now it is disappearing fast and I added leaves on top to keep a mulch cover. Hairy vetch is highly recommended to precede tomatoes. These cover crop mulches are slow-release fertilizers for the tomatoes, or anything else they are mulching, as they compost in place. The mulches with the most carbon will compost more slowly, which is why the rye lasts longer than the legume mulch. My daughter plants sweet potatoes next to her tomatoes and they provide a living mulch to keep the soil from splashing. Compost, of course, should be part of your soil fertility plan. It helps build the organic matter. Throwing some fertilizer at your tomatoes when you plant, thinking the more the better, might only result in lots of foliage and less fruit. If you do want to add something extra, wait until the plants have flowered. Keep in mind, if you walk into your local garden center which sells all sorts of chemicals, and ask them what to do for your tomatoes that are showing signs of disease, telling you about cover crops, organic matter, and mulch, if they even know about those things, is not to their benefit. They are going to show you whatever product they have on the shelf that the chemical company has labeled for your problem. Some varieties of tomatoes might work better in your area than others, so choose carefully. The seed catalogs often do a good job with their variety descriptions to help you decide. Some varieties are bred to resist certain diseases. Over the years, the ones I tried solely on disease resistance looked great, but weren’t as flavorful as others I grew. It might be that you have just bought your plants from a big-box store. That’s okay, you have to start somewhere. However, a few years back there was a big disease problem all along the East Coast. Climate conditions made it a bad year for tomatoes anyway, but contributing to the problem were tomatoes that came from greenhouses that service those big-box stores. When everything comes from one source, and that source has problems, everything has problems. Talk to the farmers at the markets this summer and ask them what varieties of tomatoes they are selling and how well they cope with disease. If they are open-pollinated varieties, you could save the seeds yourself from the tomatoes you buy at the market, or ask the farmer if you can buy plants next spring. Begin to take notice of your plants. Which ones survived the summer the best? If you also liked them for other reasons, save the seeds for next year. Over time you will develop a strain of that variety that works well in your spot under whatever conditions exist there. No matter what tomatoes you have in your garden this year, you can learn a lot by watching, taking notes, and talking with others. When you are planning your garden next year be sure to look back at your notes and plan accordingly. You did a good job last fall getting cover crops planted. Now, they’ve taken over your garden and you don’t quite remember what you had planned to do with them. What you’ve done is to grow great biomass for your garden that you can use as compost material or cut down as mulch right where it was grown. Give yourself a pat on the back! The next step is to cut it down at the right time as mulch-in-place or cut it and put the material in the compost pile. At this stage it is all green matter and your compost would benefit from an addition of an equal amount, by volume, of dry, carbon material. At this time of year my carbon comes from Jerusalem artichoke stalks, or sorghum and cornstalks that I put aside in the fall. Maybe you have access to leaves, hay, or straw. If you are bringing in that material from outside sources, read my post Killer Compost to know what to look out for. Water well when building your compost pile. Last May I wrote Cutting a Rye Cover Crop at Pollen Shed. It speaks to the importance of cutting your cover crop, in that case cereal rye, at the time when it has reached its most biomass, just before it produces viable seed. For any crop, that would be when it is flowering. You don’t normally think of grain crops with flowers, however, you will see where the seed heads begin to form and the pollen will be hanging off it. If you cut it earlier than that, the rye and wheat plants, like the grasses they are, will grow back. If you wait too long, seed will form. That’s okay if it’s seed you’re after. In that case, you would wait longer to cut it and need to make sure the seed has matured. One way to test is to cut a few seed heads and thresh out the seeds in your hand. If you don’t get seed that looks like what you planted, it’s not ready. After the plant has put its energy into seed production, it begins to die. 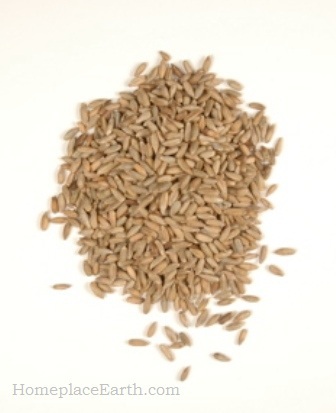 You will see the rye and wheat plants begin to turn brown when it is time to harvest the seed. The harvest will be seed and straw and usually occurs here in mid-June. Here in the Mid-Atlantic in zone 7 our last frost date is around April 26. Cereal rye is my major cover crop and generally sheds pollen around the end of the first week of May. That’s also about the time that the farmers who are on top of things are making their first cutting of hay. This year, however, the weather seems to be all mixed up. We didn’t have much of a winter and warm weather arrived early. Usually we have a spike in the temperature in the second week of April, fooling people into setting out their tomatoes, only to turn colder before the weather has settled. The weather did a good job convincing my rye that warm weather was here and it flowered early. I cut it in the beds where it would be left for mulch on April 20. I’m really interested to see how the rye and wheat do that are in the beds to be grown out for seed. The temperatures here dipped into the 30’s on April 24th and 25th after nighttime lows in the 60’s on April 16th and 17th. Looking back to my temperature records from last year, I see that the April nights were consistently warmer in 2011. Last year I cut the rye for mulch on May 10. It must be the lack of winter this year, not warm April nights that brought the rye to flower earlier in 2012. My video Cover Crops and Compost Crops IN Your Garden shows my management of this system. It might be that you have grown Austrian winter peas or crimson clover as your cover crop. These crops are legumes which fix nitrogen from the air in the nodules on their roots, returning that nitrogen to the next crop as those roots decompose in the soil. You could cut these crops at flowering and let them lie as mulch, as with the rye, but their biomass wouldn’t be as long lasting as the rye. They are best used as green material for the compost, adding carbon to capture all the nutrients as composting occurs. 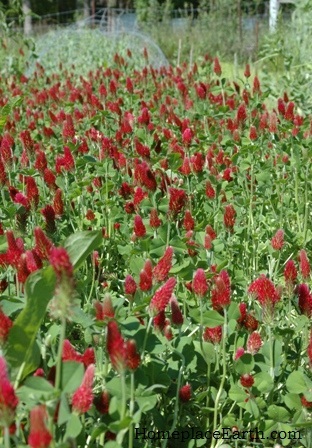 Crimson clover, not to be confused with red clover, is a beautiful plant that generally flowers here around mid-April. The legumes can be easily pulled out or cut for compost material and the bed planted soon after. I wait two weeks to transplant after cutting the cereal rye beds for mulch, but I could transplant sooner than that into the legume-only beds. If I was seeding into the beds, I could easily do that in a legume bed two weeks after cutting. If I was only after the biomass and in a hurry to get the next crop in, I would cut crimson clover as soon as it has flowered. However, I have bees that enjoy it, so I wait a little longer before cutting so they can have the most benefit from the clover blooms. Sometimes hairy vetch is planted in the fall to precede tomatoes. I’ve done that in two tomato beds this year. I prepared the beds last fall and moved the tomato trellises there at the same time. The vetch grew up and I cut it April 25. My tomatoes are ready now in the coldframe for planting out. I started the seeds there on March 16. 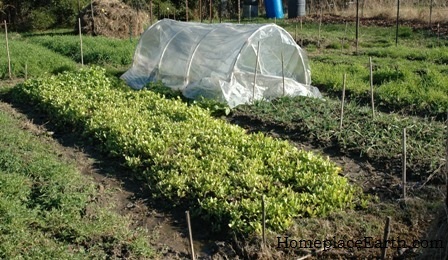 Having grown in the coldframe, they are already acclimated to the outdoor temperature fluctuations. Sometimes hairy vetch can be a nuisance in the garden. In the past I’ve used it as a companion to the wheat and rye and you can see that in my cover crop video. You can also see how it became a problem in the rye. It is good to plant a small amount of a legume into your grain crops and the legume I use now is Austrian winter peas, a winter hardy variety of field peas. Both the vetch and winter peas will grow quite tall and could pull down the grain if left to grow. That doesn’t matter if I’m just cutting the crop to lie down as mulch, but if I want the grain later in the season I need to pull out the vetch or winter peas. Austrian winter peas are much easier to pull out than the vetch. 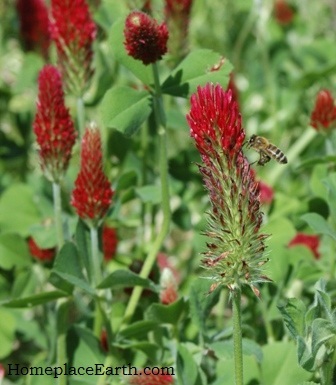 If you are growing grain on a larger scale than your garden bed, you might choose red clover as the companion to the wheat or rye. You can seed it into the growing grain in the spring. The red clover will grow some and provide a nice green cover when the grain is harvested, then it will keep on growing and a harvest can be taken the first summer. Let it grow over the winter, then harvest twice the second summer. After that it is time for another crop for that space. You can find the best cover crops for your location and situation by reading Managing Cover Crops Profitably, 3rd edition, available from www.sare.org. Be sure to read all the text, not just look at the charts. There is a lot to learn and every time you think you have it down, something else comes along to figure out. The important thing is to let the soil and the garden guide you.